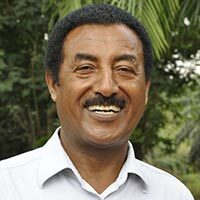 Abebe Menkir holds BSc-in Plant Science, MSc and PhD in Plant Breeding from Addis Ababa University (Ethiopia), University of Manitoba (Canada), and Kansas State University (USA), respectively. Prior to his assignment at IITA as a maize breeder-geneticist in 1996, he worked as a sorghum and finger millet breeder at the Alemaya College of Agriculture and the Institute of Agricultural Research in Ethiopia. His current research emphases at IITA include breeding for high yield potential, resistance to diseases and Striga, drought tolerance, enhanced nutritional quality, and resistance to mycotoxin contamination. He has been the team leader for maize improvement research at IITA since 2001 and collaborates with several scientists working in different disciplines. He works with scientists in the national programs and the private seed companies to promote delivery of improved seeds to farmers. He served as an elected member of the Research Committee of a regional maize network for 8 years that reviewed project proposals and progress reports and recommended funding to the NARS through the network. He also served as elected coordinator of the IITA multidisciplinary project on maize-grain legume production systems from 1999 to 2001. He has established strong linkages with Purdue University, University of Illinois, National University of Ireland, and USDA-ARS to enhance the various breeding activities at IITA. He has trained 10 graduate students under his supervision and guidance, and developed a large number of inbred lines, open-pollinated varieties, and hybrids and made them available to partners. Twelve open-pollinated varieties and 14 hybrids developed in his breeding program were released for production in different countries in West and Central Africa. Eight open-pollinated varieties and 10 hybrids developed in his breeding program were released for production in different countries in West and Central Africa. He registered more than 100 inbred lines with different specific traits in Crop Science. He is an author or co-author of two books, more than 90 journal articles, 12 book chapters, 20 abstracts, more than 80 workshop presentations, 19 invited presentations, 4 monographs, 3 newsletter articles, and 13 annual reports.